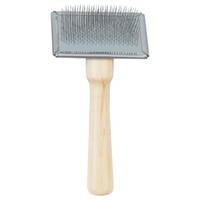 Ancol Ergo Wood Handle Soft Slicker Brush has been crafted with a traditional wooden handle and is great for dogs that have a longer coat. Although the Soft Slicker Brush has been primarily designed to remove tough mats and tangles, it will also remove dead skin cells, pull out dead hairs and gently stimulate the skin. Using the Slicker brush regularly will remove any uncomfortable hair and help your dog to maintain a healthier, shiny coat. Additional advice on grooming your dog can be found on the back of the products packaging.